Folding Pleated Fan. France, 1805-1810. Gift of Miss Elizabeth d’Hauteville Kean.1923-24-8. These fans are only 7 inches (17.8 cm) tall and 13 ¼ inches (33.6 cm) wide in the open position. In the last quarter of the eighteenth century, only 25 years before, typical fan sizes were in in the range of 11 inches tall and 19 inches wide in the open position. Social commentary of the time connected the use of smaller fans to bolder behavior in contemporary women who no longer needed to demure behind a larger fan. Women’s clothing of the early 19th century reflected a similar change in attitude and freedom for women. 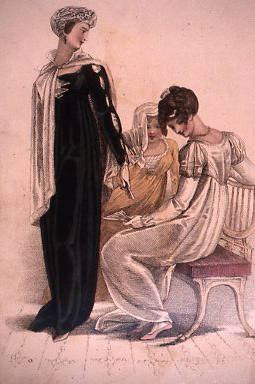 After the French Revolution (1789-1799), fashion changed radically for women with an emphasis on simpler, lighter, less confining, and more natural styles that were less obscuring of the human figure. The “Empire style” (1800-1815) was based on the classical attire found in ancient Greek and Roman sculpture and the way in which the fluid folds of the fabric reveal the body beneath. Excavations in Pompeii and Herculaneum at this time further fueled neoclassical taste. Period depictions of the Empire style can be found in fashion plates, such as this 1810 image from the influential British periodical, Ackermann’s Repository of Arts. A fascination with the classical past is further expressed in the subject matter of the Cooper-Hewitt fan, which is an allegorical homage to a hero returning from war. The figure in the center of the leaf probably represents Athena, who protects heroes and stands for wisdom, charity, and victory in war. She receives tributes from a kneeling virgin while a dancing maiden celebrates to the right. An allegorical figure of Fame blows a horn and cupid sleeps on the implements of war. The theme of honoring a returning hero is continued in the finely carved ivory stick design, which may represent the return of Odysseus. The extraordinary craftsmanship and detail in this diminutive fan make it one of the treasures of the collection. 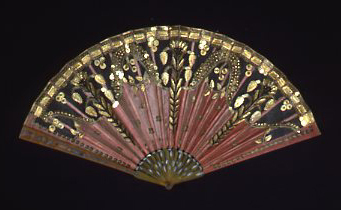 Folding Pleated Fan, 1800–10. Gift of Anonymous Donor. 1952-161-240.